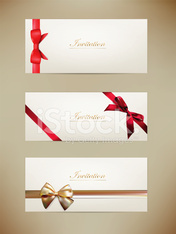 Gift cards and invitations with ribbons. Abstract Ethnic Seamless Geometric Pattern. Paper card with diagonal ribbon and tied bow. Paper card with ribbon and tied bow.